So much of our beloved foods and recipes are loved for the memories attached to them, just as much as the taste. Thomas BBQ Mashed Potato Salad is the best potato salad I have ever tasted (in my life) but there is a reason beyond that which makes it even more special. 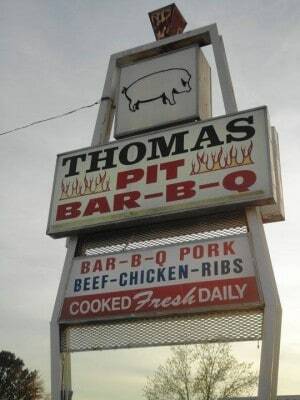 Thomas Pit BBQ was an icon in Madison County. I don’t know when it was opened or how long it was in business but I can definitely say more than my lifetime. People would line up and sit in their cars for 45+ minutes to get their juicy smoked chicken, pulled pork bbq, white sauce, and potato salad (among other things). Everything on their menu was amazing. What was even more amazing is that if you ordered a plate in that window in 1980 and then in 2014, you likely had the same people preparing that food and handing that plate to you. We knew them. They were friends and family and we expected to see them when we went to Thomas’s. My parents used to own a business down the road from Thomas’s and from time to time the owner would trade out bbq plates for goods from Mama and Daddy. We always got the good end of the deal with those transactions :). But a few months back Thomas’s was bought out by a local chain bbq place. The employees were given less than a days notice and we all watched in horror as the building was torn down and cleared to make way for a new building. There isn’t a lot anyone can do now so I set about trying to recreate the two recipes that I went there for. I came awfully close with my Dutch Oven Smokehouse Chicken and of course we all have the classic Alabama White BBQ Sauce recipe. Several years ago I figured out how to best duplicate slow smoked pulled pork by using my slow cooker. Today, though, I’m bringing you the recipe that had emails pouring in to me after Thomas’s closed. Folks who know how I love the place immediately started emailing me “I wish you would come up with Thomas’s potato salad recipe!” and my mother has been leading the charge. “Christy, we have to come up with a potato salad like Thomas!” This is a very unique potato salad with an incredible flavor that runs throughout every single bite. My recipe is not the actual recipe they use, I don’t have that, but Mama and I believe it is close enough to pass for it. So while I can’t bring Thomas Pit BBQ back, I can make my favorite dishes from there and tell my kids about a little bbq joint that used to have folks lining up for wait times few would even consider today – and I can give them a taste of why. You’ll need: Mayo*, Yellow Mustard, Cubed Southern Style Hash Browns, Sweet Pickles in a jar (not relish), 3-4 boiled eggs, yellow onion, and salt and pepper. *Okay y’all. I’m not a mayonnaise person. I will eat it in a recipe with no problem but I’m just not someone who ever says “Ooh, yay, mayonnaise.” But so many of you carry on and on about Duke’s that I bought it for this recipe. Once I added it, I licked the spoon a little bit. I’m still not in the “oooh yay, mayonnaise” camp but I will say that it was decidedly different and much better tasting than any mayo I have had before, so you win :). Place your potatoes (hash browns) in a large pot and add enough water to cover. Bring this to a boil over medium high heat. Once boiling, allow to cook for about ten minutes, or until tender. Drain. Place potatoes in a large bowl. Now here is the thing and I don’t have a lot of pictures to represent it so just really pay attention here because this is important. You need to dice, by hand, 1/2 cup of sweet pickles and 1/2 cup of onion. Once they are diced you want 1/2 a cup. Now, take that half a cup of each (I just put them all together) and run it through a blender, chopper, little smoothie mixer, or something like that because we want it really, really fine. 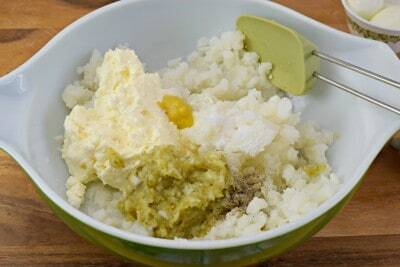 We don’t want it to be a puree but we want it minced like this. This will help that flavor spread throughout every bite of potato salad and is really one of the keys to why this is so good. 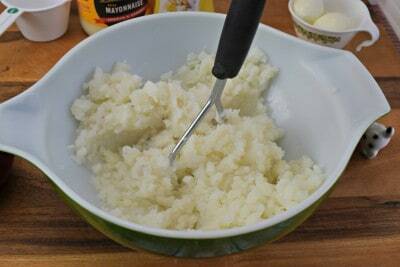 Use a hand potato masher or a long tined fork and mash up the potatoes a little bit. You still want them to be lumpy but just a good bit of mashed in there with the lumps. Add all other ingredients except for the eggs. So you’re adding in your mayo, mustard, minced pickles and onions, salt, pepper, and pickle juice. The pickle juice just comes straight from the jar of sweet pickles. That’s why I didn’t want you to get sweet pickle relish because there isn’t enough juice in there. Stir that up really good. Then chop your eggs and add them in. Now I don’t believe Thomas’ Potato Salad had eggs in it but I just love boiled eggs in potato salad. If you love them, be sure and add them in. If you don’t, feel free to leave them out. For me, they just make it extra special. Once eggs are stirred in, cover and refrigerate several hours or until chilled. Enjoy the best potato salad I have ever put in my mouth! Place hash browns in large pot and add enough water to cover. Bring to a boil over medium high heat. Once boiling, allow to cook for ten minutes, or until tender. Drain potatoes and place in a large bowl. Mash all of this up a bit with a potato masher, but leave lumpy. 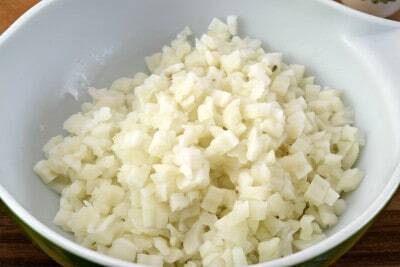 Place chopped sweet pickles and chopped onion into a blender, chopper, or small smoothie blender and pulse a few times until very fine, almost like a relish. 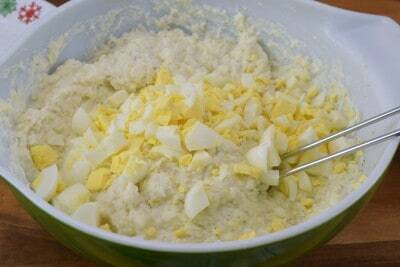 Place mayonaise, pickle juice, mustard, finely minced pickles and onions, salt, and pepper in bowl with potatoes. Stir until well mixed. Stir in chopped eggs until incorporated. Cover and refrigerate several hours or until cold. Enjoy! A. Feel confident Thomas’s used dill instead of sweet pickle. B. Can’t bear the thought of sweet pickle in a potato salad and prefer dill. So I just wanted to pop in and reiterate that this is my version of the recipe and as a person who really, really loves sweet pickles, that is what I naturally used. You, of course, are welcome to substitute dill if that is what you prefer. There is a good chance that is what Thomas’s used since they served dill pickle spears with some of their entrees. Just go with whatever cranks yer tractor. Yep, gotta have Dukes! I won’t buy anything else. where do you buy Dukes? I got my jar of Dukes from Amazon. I’m a Hell man’s fan. Love it n prefer it over all others I’ve tried, including Dukes, Kraft, B.P. The others are good but I still buy Hellmans. I agree!!! 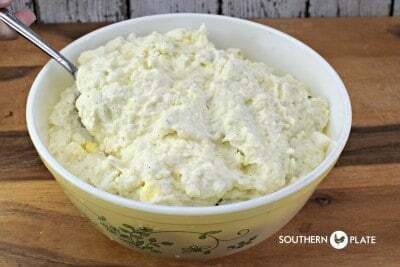 My grandmother made potato salad like this with regular potatoes. I loved it then my children loved it too. I miss her so much!! ps – I don’t think the 1/3 mustard is showing up properly…I just see “1/3”. Thank you so much!!! I’m glad you caught that early. I type my posts up in a word document and when I pasted it in I missed a few lines. It is fixed now! Is it 1/3 cup mustard or 1 heaping teaspoon? The above recipe says 1 heaping teaspoon and someone commented that it was 1/3 cup mustard. I also agree that Duke’s is the very best mayo! Thanks for the wonderful email I truly enjoy them. I double checked the recipe and I didn’t put 1/3 cup of mustard anywhere. I’ve looked over it and double checked my notes that I typed from and the recipe above is correct as I prepare it. You have mustard written in there–but no amount that I could see. Also it is in the picture of ingredients. Was sure that Mary Thomas used celery in the potato salad. Probably. But I don’t really like celery in potato salad so that’s why it’s missing in my version :). Please feel free to add it in yours though. Hope you enjoy it! I like celery in mine, too. Another thing I like to do is very finely dice up a couple of radishes into it. YUM! I do not like sweet pickles so this shocked me because I loved Thomas’ potato salad. What business did your parent’s own? I am from the area. A friend told me that Thomas BBQ used dill pickles in their potato salad. I make a copy cat Thomas version and I use finely chopped green olives as well as white sauce and Liquid Smoke, but no eggs. Love, Love, LOVE, ‘Thomas BBQ’ Potato Salad!! So glad you posted this! I loved their potato salad. I was sad to hear that the Thomas’ had sold the business. And even sadder that the building was torn down. I’ve sat in line down hwy 72 many times to order food. They also had really good onion rings! My mother worked there when she was young and she’s in her 60s now. I remember Brut, my grandmother called him, chopping that BBQ up when you would go thru the drive thru. Many fond memories from there. Thank you so much! LOVED that place… it was always there.. so sad. Best BBQ and sides ever! My mouth was watering reading the recipe! I loved their sandwiches and ‘fat’ fries! Not many people have ‘fat’ fries! Wow-the pickles surprise me too. I liked it cause it tasted like my Yankee mothers and grandmothers. They had all the same ingredients except the pickles. Can’t wait to try this! It is always so sad to see a place you loved to go to get demolished like that. I’m glad you were able to recreate some of the recipes you remembered so well. I learned the Hashbrown trick from your short cut potato salad recipe. Life changing!!! Thank you! I will be making this version this weekend! I’ve never met a potato salad I didn’t like and I can’t wait to try this one. And Duke’s…………yes ma’am, nothing like it. It’s the only one I’ll buy. Hi Judi… I make a macaroni salad that is very similar to this…basically try this recipe with a pound of macaroni and add about half a cup of shredded carrots and a 1/4 cup of celery. Christy is da bomb when it comes to recreating a classic that NEEDS to be recreated. This Potato salad sounds delicious. Sadly, we cannot get Hash browns cubed or shredded in Ireland but can make my own. Looking forward to making this. Many thanks for recipie. With the onions and pickle, do you add the other half cup, that is not minced fine, to the salad as is? Jeff, the way I read it was there is not another 1/2 cup. It is just the 1/2 cup onion and 1/2 cup pickles. Read it again. A little bit further it states that. I thought the same as you the first time I read it. This is the way my mother has always made potato salad, except she diced her own potatoes. She also used sweet pickle cubes (not relish) from a jar. They sell both kinds here. If this tastes anything like my Mom’s, this potato salad is AWESOME! I love to eat it when it has just been made and is still warm! Oh my goodness, it does look bare doesn’t it! sweet pickles – really? I’ve never detected a sweet in it. I use finely chopped green olives in my Thomas salad. A friend told me they used dill. I also add white sauce and Liquid Smoke. Oh, I loved that stuff even more than the BBQ!! Sweet pickles, really ! 🙂 Sure do miss it! I love liquid smoke. Thank you for posting this recipe! This is how I have made potato salad, but just peeled and cubed my potatoes. I need to look for the Duke’s mayo. I hope you can find it Joanne!!! We always eat dlvieed eggs. The first time I made them I thought my mom put seasoned salt on them so I sprinkled it on the eggs and my mom asked what I did to them because they had a zip to them, so I told her and we had a good laugh when she told me she puts paprika on them!! Every now and then I use season salt when I want a zip, but mostly we use paprika. I like to garnish mine is chopped green onion and a slice of olive. It would be interesting to see how everyone makes them. Mom never made them till she moved here to the states, so I don’t think they were common in Germany they might now, but not when she first married my dad. He was the one who taught her how to make them. Now funny! I will have to try seasoned salt…I think the eggs could use some zip. I have tried to duplicate the recipe for years and finally came up with one that matches the taste pretty closely. But, what I liked most about their potato salad was the taste of dill, not sweet pickles. So, give it a try with dill pickles and juice and see what you think. I also like to add fresh dill to the salad. But thank you for the hash brown potato hint. That hint will definitely cut the prep time in half! Thank you so much for all of your delicious recipes and friendly blogs! I will have to try that, thank you so much for sharing Mary!!! I’m going to try this recipe. I have always used dill pickles, but I can always try something new. I have to have chopped celery, tho, for the crunch! I love your recipes and the pictures of you and your family. Thank you! Thank You so much Sue, and you can certainly add the celery for your tastes!!! Since you gave us this copycat recipe for the delicious potato salad, I wonder if you can come up with a copycat recipe for Applebee’s Oriental Chicken Salad Dressing? While the salad is easy, the dressing has been an elusive dream for me to create. There are some copycat recipes on the web for this dressing but nothing has actually tasted like Applebee’s and I’ve tried several of them. At the ripe old age of 70, with no Applebee’s restaurants in my little town, I don’t get this as often as I would like. Any possibilities? BTW, I love reading your blogs almost as much as trying your recipes! Omg! Yes, please! I love that dressing! Hey Linda! Have you asked the manager at your local Walmart if they can get it in? I know here ours will order things when asked. I live in a Houston suburb, and I get Duke’s at HEB or at Kroger’s. I wouldn’t think of using anything else. I just wish they also carried Duke’s salad dressing. We are thinking of making a trip to Louisiana just to buy that and REX crab boil. Where do you find hash browns that you boil? I’ve only ever seen frozen ones. I love that I don’t have to peel potatoes so I will definitely try this recipe. Thanks for posting! I buy the Southern-style cubed ones from the frozen section at Walmart. Hope that helps!! That potato salad sounds wonderful. Thank you so much for the recipe. I will make it tomorrow. Christy, you are a blessing to me. Oh my goodness Linda, thank you! You are a blessing to me, too! I can hardly wait to try your recipe this weekend. Love to use sweet pickles. I’m also happy to learn about using frozen cubed potatoes to save time and the trouble. Could you use sweet salad cubes since they will be chopped finer in blender? My arthritis in my hands is so bad I have to use all shortcuts. Love all your recipes. Good Job Christy. I am so sorry for your loss Rhonda, it is always so hard to lose those we love. I hope you get a chance to make the potato salad soon and savor some of those precious memories of your Dad enjoying friends and family! What was your Grandma’s name. I am related to the Thomas BBQ folks. Christy, how many servings for this recipe, please? Thx! Going out on pontoon boat Sunday to celebrate stepson grad med school. Making this for 10-12. Thought would add pimento for color. Have a wonderful blessed Memorial Day weekend! Thanks so much for this recipe. It’s very close to my mother’s method. She also insisted on dicing the sweet pickles and adding a little bit of the pickle “juice” instead of using pickle relish. My potato salad cheat for when I don’t have time to peel and dice is to use canned diced potatoes. 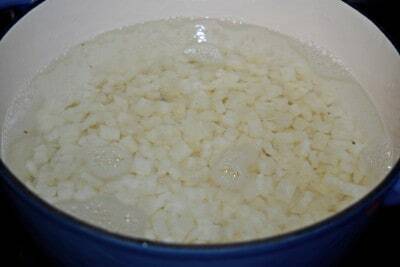 I rinse and drain the potatoes then drop them into boiling water until they get a little mushy. This gets rid of the canned taste and nobody has caught on yet. My mother always said you had to add the rest of the ingredients while the potatoes were still hot. 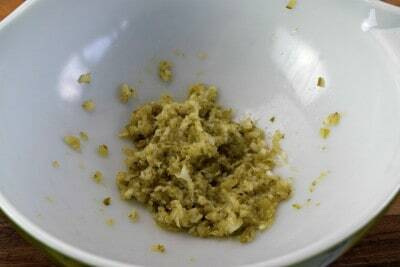 She’d mix with a fork, mashing up some of the potatoes as she went so she’d have that lumpy mix of pieces and mashed. 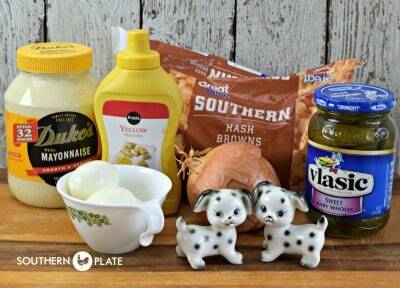 My grandmother used to make a no mayonnaise potato salad which I sometimes make to keep the recipe going. I’m wondering if anyone is familiar with anything like this since she’s the only person I’ve known to make it. She would mash the potatoes completely until smooth and add salt, pepper, finely diced onion and apple cider vinegar. I always add the vinegar to taste since it’s a grandmother recipe with no measurements. You should be aware of the vinegar, but it shouldn’t be tart. She’d spread the mixture out in a glass baking dish so it would be a couple of inches deep. Then she’d top the salad with bell pepper rings with a slice of hard boiled egg inside each pepper ring. It looked so pretty and the pepper ring defined a serving. She served it room temperature, and it was great with fried chicken and green beans. Thank you again for your blog. It’s like going home! What a great idea on using the canned potatoes!!! Hi, Christy, I’ll try to keep this short but no promises! First off, I’m a Christian, or at least I try to live a Christian life. I can’t handle parts of the Bible because it’s like reading a horror story. It gives me nightmares for weeks. That said, I really enjoy your blog! I’ve tried a lot of your recipes since signing up and they have all been worth doing again! Here in NC we like Eastern Carolina BBQ. The sauce is vinegar -based and vinegar is good for anything that ails you! As for the pickles in the potato salad, my sister puts sweet bread-&-butter pickles in her traditional potato salad. Our mother used only Russet potatoes, Miracle Whip, green peppers, salt, pepper, garlic & onion powder and celery seed (the secret ingredient.) That’s still my favorite, but I haven’t tried your take on Thomas’s. I will soon! Thanks for bringing some good old Southern recipes to life again. (I lived in Leeds and Birmingham on and off for 13 years when much younger.) I really enjoy your posts!